Ride Your Bike to Support Climate and Energy Solutions. I have been seeing so many people on bikes in Los Angeles, ok, mainly down by the beach in Venice, Santa Monica and Marina del Rey but in other parts of town too. I am thrilled whenever I can take a bike to shop or go wherever I am headed, and here in LA I find it pretty easy and even more convenient at times. It sure saves on parking time. 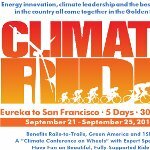 I just read about Climate Ride, which is a fund raising bike ride to support climate and energy solutions. There will be two rides, one in Northern California this September and then one in June from New York to Washington DC. Both sound like they will be beautiful rides. Each evening riders will be able to hear speakers so it will be a climate and energy conference on wheels, a fundraiser and an opportunity to show many communities, and hopefully beyond, the importance of looking for and utilizing new energy solutions that do not harm the environment, people and animals. The web site has lots of good information, including how to train for the ride. So if you ride or if this could motivate you to ride, check it out. I am tempted to bring SmartLifeways back east in June for the ride-maybe I will see you there.